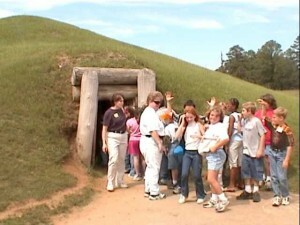 School kids entering the Earth Lodge at Ocmulgee Mounds. 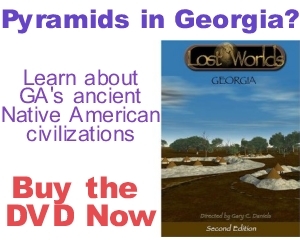 The Ocmulgee Earth Lodge was the likely location where this trading empire was centered. 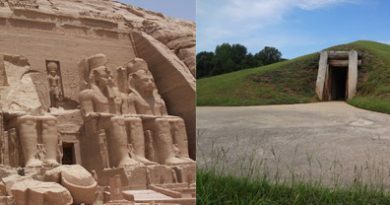 It is the most unique structure at Ocmulgee and although at first it appears to be a conical mound, it is, in fact, a building covered with earth. 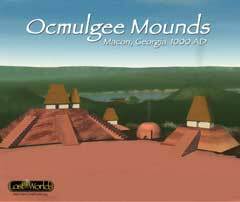 As mentioned previously, one version of the migration legend states that the first structure the Cussitaws built after conquering the Ocmulgee Mounds site was a “mound with a central chamber.” That is a perfect description of the Ocmulgee Earth Lodge. 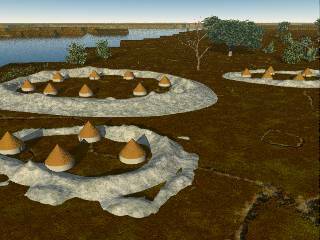 The structure includes characteristics of both the midwestern Pawnee earth lodges as well as the kivas associated with southwestern Ancestral Puebloan (Anasazi) settlements. 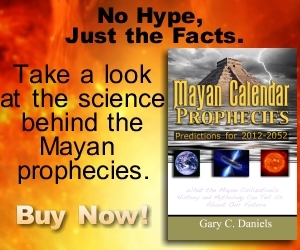 It has a circular solid outer wall upon which the roof beams rested like the kivas of the Southwest and unlike the earth-covered log walls of the midwestern earth lodge. Yet it had the tunnel-like entrance of the midwestern earth lodge which the southwestern kivas lacked. 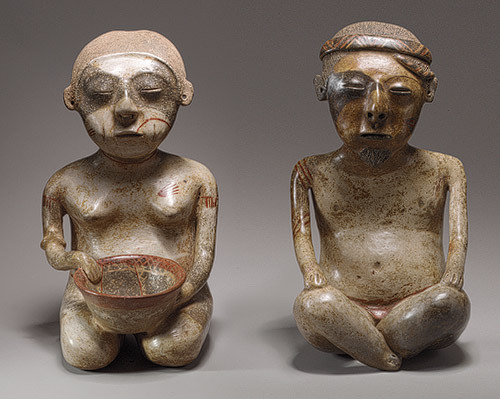 Thus it seems the Cussitaws likely blended elements from the various cultures they came in contact with on their long migration out of west Mexico, through the southwest and midwest before finally settling at Ocmulgee. 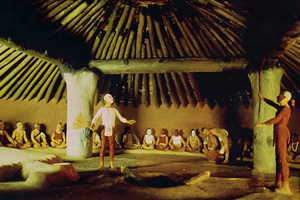 Model of the interior of the Ocmulgee Mounds Earth Lodge. The Earth Lodge seems to have been a council house where important discussions took place. One version of the migration legend suggests it was a place where warriors would gather. Forty-seven seats on a low clay bench were arranged around the interior wall. A central opening in the roof admitted light and emitted smoke from the council fire. A bird-shaped platform west of the central fire pit contained three elevated seats (bringing the total number of seats to 50.) Clearly the three people who sat here were very important people among Ocmulgee’s leadership. 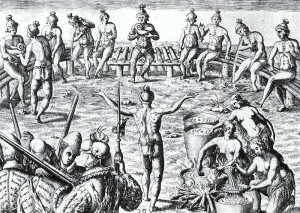 A Black Drink ceremony among the coastal Timucua tribe as witnessed by the French at Fort Caroline in Jacksonville, Florida in the 1500s. A large seashell was unearthed by archaeologists during excavations of the Earth Lodge. Early European explorers noted that this type of seashell was used as a communal drinking vessel for a drink known as cassina or the “black drink.” Cassina was a type of tea made from the leaves of the yaupon holly plant which contain high concentrations of caffeine (perhaps as much as three times the caffeine as a similar quantity of coffee.) 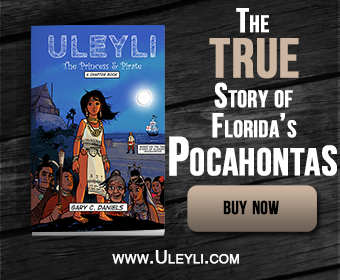 Women prepared the beverage, which was only drank by the men, and served it hot by using a gourd to dip it from the main brewing pot into the shell drinking cup. (Apparently they also used the gourd to froth the tea as well.) Drinking a highly caffeinated beverage hot allows more of the caffeine to be absorbed and passed into the bloodstream. The men drank this beverage before long council meetings, going to war, or participating in their ball game (which they referred to as the “little brother of war” and sometimes could last for days.) It appears this was the Native American version of an energy drink! They would also use this beverage as a body purifier by consuming large quantities and then forcefully regurgitating it. For this reason it was also sometimes known as the “white drink” since white was associated with purity. Also, since the yaupon holly plant only grows in coastal areas, its leaves were likely an important trade item controlled by the elites at Ocmulgee. This Caddoan head pot features a stylized bird design engraved around its eye. View an interactive 3D model. The most interesting feature of the Earth Lodge is the raised platform in the shape of a bird. This bird design is very similar in design to a decoration on a Caddoan head pot from Arkansas. 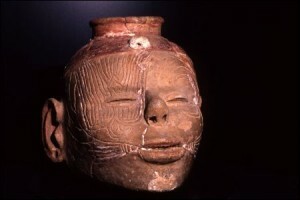 The pot features an individual, clearly modeled from real life, with an eye-surround in the shape of a stylized bird very similar in design to the bird platform in the Ocmulgee Earth Lodge. Several of the Caddoan tribes, including the previously mentioned Pawnee, built round earth lodges. 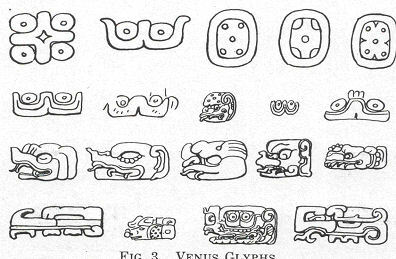 (I explore this connection further in the featured article “Were Georgia’s Indians from West Mexico?“)Continues….